Ai Weiwei is focusing on the plight of refugees in Greece. 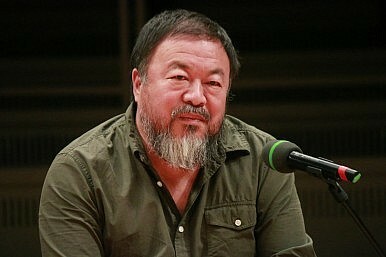 In December, Al Jazeera reported that Chinese artist Ai Weiwei was visiting refugees on the Greek island of Lesbos, where he has set up a studio to help draw attention to their plight. The report included images from his Instagram account, including a “lovely boy from Syria,” and another that showed Ai holding up an emergency blanket like a flag. Last month, Ai laid on a Lesbian beach and posed as Alan Kurdi, the drowned Syrian boy who washed up on a Turkish shore near Bodrum this past September. In 1898, the Greek poet Konstantinos Kavafis, also known as Constantine Cavafy, wrote his famous poem “Waiting for the Barbarians,” describing legislators who don’t legislate because “the barbarians will make the laws when they come.” That line prefigured the criticism that European leaders should do more to prevent migrants from entering Europe, and that local law enforcement is enabling them to flout the law, as exemplified by the New Year’s Eve sexual assaults in Cologne and the We are Sthlm sexual assaults in Sweden, where officials allegedly covered-up reports of assault in order to avoid fanning the flames of anti-migrant sentiment. The poem ends, “some who come from the borders say there are no longer any barbarians. And now what will happen to us without barbarians? Those people were a kind of solution.” The suggestion is that the threat of barbarians provides a common enemy, though possibly a false one. Like any great artist, Ai has identified a crucial human conversation and placed himself in the midst of it, standing at the border and declaring that, indeed, there are no longer any barbarians. In this regard, he challenges Europeans who oppose immigration. But, as a Chinese citizen partaking in the debate, he also challenges the idea that this is none of China’s business, arguing that it’s not a European problem, but a human one. China, however, tends to remain uninvolved when it comes to political crises. For instance, although it provided medical aid during the 2014 Ebola crisis and gave generously to Nepal following last year’s earthquake in April, China folded its arms and watched during the Rohingya refugee crisis that took place only months before. And, since 2012, China has contributed only 0.1 percent of the global humanitarian aid effort to Syria. Its reasoning is more or less summed up by a September 2015 essay in People’s Daily, which argues that the Syrian refugee crisis is the inevitable result of the West’s “short-sighted” attempts to push democracy upon the rest of the world, whereas China prefers to refrain from political meddling and, as at home, favors political stability. This often means securing the power of those who already hold it, or at the very least, not taking sides when a civil war breaks out. Back in 2011, Foreign Ministry Spokesperson Jiang Yu characterized China’s position by saying that “the future of Syria should be independently decided … free from external interference,” and so far, Beijing has stayed true to this belief. Ai, however, clearly believes that engagement is the best approach. Last month, Denmark passed a law “requiring newly arrived asylum seekers to hand over valuables, including jewelry and gold, to help pay for their stay in the country,” the New York Times reported. As a show of protest, Ai shut down his Copenhagen exhibition. Ai Weiwei Camps, a Facebook page that chronicles his efforts in Greece, posted an image days later of a November 1938 New York Times article entitled, “Jews on Knees Beg Netherlands Entry.” Ai has also said that there should be a memorial to the Syrian refugees, and he recently walked eight miles across London with sculptor Anish Kapoor in order to raise awareness for, and show his solidarity with, these people. Beijing is set to be a major player as Syria rebuilds – but that includes footing the lion’s share of the bill. Is China Increasing Its Military Presence in Syria?Why Do Chinese Citizens Care so Much About Airstrikes on Syria This Time?Why Do Chinese Reject Middle Eastern Refugees?Will China Pay for Syria to Rebuild?Xi’s Davos Speech: Is China the New Champion for the Liberal International Order?